Pep up your snack time with these Skinni Snax Original chickpea and soya snacks. These snacks are a healthier alternative to calorie and carb-laden options such as crisps, popcorn and nuts, thanks to their nutritious soya and chickpeas blend. 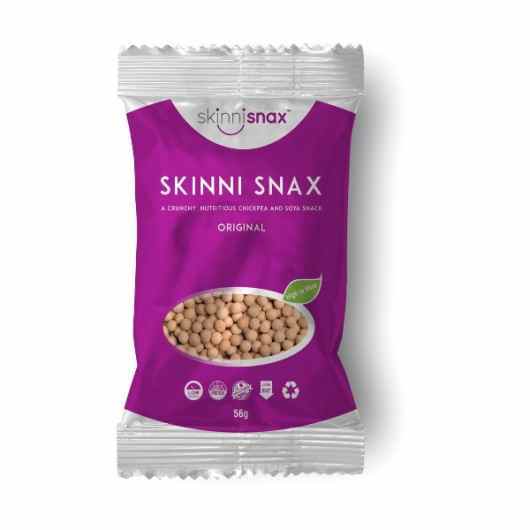 Light yet filling, Skinni Snax are high in fibre and a source of protein, while also being low in fat and a source of Vitamin B. They are double baked for a deliciously crunchy texture and seasoned with salt for a delicious snacking experience. Pick up some now and take snacking to a new, guilt-free level! Chickpeas, Soya, Flour, Sugar, Starch, Salt. Produced in a facility where nuts, dairy and soy may be present. Keep cool & in a dry place.